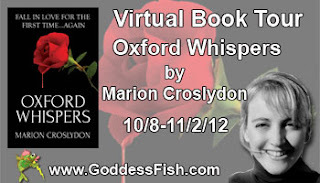 Author Marion Croslydon is here today to talk about her paranormal romance novel Oxford Whispers. This is just one of many of her virtual book tour stops. Marion will be giving away a $20 New Adult Reading pack --i.e. selected NA titles on Amazon to one commenter on her tour. So if you'd like to be entered to win, leave your e-mail address with a comment below or at any of Marion's other tour stops. The more you comment, the more chances you have to win. Feel free to leave a comment without an e-mail addy, too! Welcome, Marion. Please tell us a little about yourself. I am a true citizen of the world. I was born in West Africa, grew up in the South of France, and studied in Vienna, Paris, Berlin, Cape Town, and Oxford before finally settling down in London. This wide variety of cities has provided lots of inspiration for my writing. Talk about culture exposure! I spend a good deal of time with books, DVDs, and listening to my mp3 player; all for the sake of inspiration, of course. My debut series, The Oxford Trilogy, has been a blast to write because I can indulge in my favorite types of music: Country and English pop rock. Oxford Whispers is the story of Madison LeBon, an American student at Oxford University, with psychic powers she prefers to ignore. But when the tragic lovers in a painting begin to haunt her, she must learn to accept her gift. Otherwise, life will imitate art and Madison's own first love will be doomed. 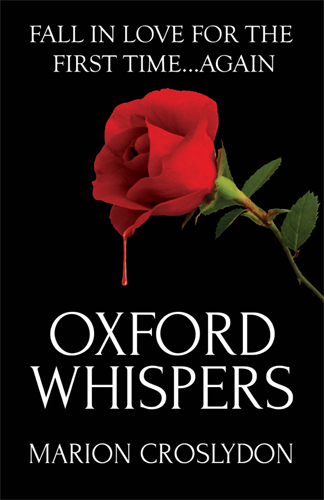 Oxford Whispers is a New Adult paranormal romance. People are not yet familiar with the New Adult genre, also called Upper-Young Adult, Mature Young Adult, or “College-Lit”. But with best-selling authors like Jamie McGuire, Tammara Webber, and Abi Glines, it should attract more and more attention. I’ve drawn inspiration from my own time at Oxford and my passion as a teenager for a Pre-Raphaelite painting by William Shakespeare Burton, The Wounded Cavalier. It is set during the English Civil War. Also, there’s a strong Voodoo component through Madison—who is kind of an “Ivy-League Sookie Stackhouse”—because I was born in West Africa where Voodoo originates, and spent a lot of time in New Orleans and Louisiana. A thick coif wraps around my head, and a black gown covers every inch of my body. As Mother ordered, its wide collar hides the contours of my shoulders. I must abide by the rules not only in public, but also in this clearing, where I spent much of my childhood. I slide my fingers between my throat and the material of the coif, loosening its tightness over my neck. My chest rises and I take in a mouthful of air. “I do not know when we will see each other again. I will stay in London for the summer months.” His somber, buttoned waistcoat makes Peter look so severe. The vest is finely cut yet bears no ornament, and a wide-brimmed hat hides most of his face. His hands are clasped on the Holy Scriptures, as if those words were his own, and I want to steal the Bible away from him. My friend should not use the name of Our Lord to serve his own ambitions. Peter takes my hand and brings it to his lips for an innocent kiss. Looking away I ignore his touch on my skin. My eyes catch the outline of something lying on the other side of the withered oak, among the ferns and yellow leaves. Intrigued, I walk away from Peter. After a few steps, the discovery becomes clear. A human form. A man. Gasping for breath. I run toward him and almost stumble over the hem of my dress. The blade of a broken sword is embedded in the tree next to him. Playing cards are scattered amid the brambles. The Ace of Hearts stares up at me. Cruel pleasure poisons my friend’s words. I kneel by the soldier’s side and support him with my right arm. His eyes are closed, his mouth open. Holding my handkerchief over the wound on his neck, the cloth is quickly stained crimson. The elegant man is alive, barely. I let out a sigh of relief. “We need to take him to a physician.” My voice is steady, but I avoid looking up at Peter, who stands rigid next to me. The Cavalier lays his left hand on mine, and my soul shivers. His eyes have opened. They bring back the cherished memory of another meadow in the spring sun and a young boy who gave me a red rose. I was a child then, but I can still remember his smile. The Cavalier’s smile. Peter does not mean justice. He means slaughter. My own people will have the Cavalier executed. I will not allow more blood to be shed. Not his blood. I know at once, with clarity, what I must do. MADISON SPIED ON the Puritan, and the Puritan spied on the lovers. He hid behind a tree, his hand clenched on a Bible, his mouth twisted into a snarl. His hatred radiated out of the painting into the classroom, and punched Madison in the belly. She closed her eyes. Violent scenes flashed behind her lids. Severe faces stared back at her, and battles played out around her. She saw blood. Blood on her hands and on the face of the Cavalier, the other man in the painting. The warm liquid stuck to her skin. To her soul. Like a freakin’ Taser shot. A wave of nausea flushed through her body, and an acrid taste invaded her mouth. She stood, but her knees buckled. Shuffling the few inches back to her seat she flattened her palms on the cold surface of the desk. The contact helped, but briefly. Madison dragged her attention back to the painting, spread by the slide projector all over the classroom wall. In a forest clearing, a blond Cavalier lay in the arms of a young girl. Judging by his limp posture, he’d been badly injured. On the right side of the scene, a man dressed in black—the Puritan—watched. A plain hat covered half of his face. But Madison could see enough of his expression. He reeked of jealousy. “Miss LeBon, do you need to take a break?” Doctor McCain’s familiar East Coast accent took her out of her trance and brought her back to the classroom. As she shuffled in her seat, Madison’s chair squeaked. The other students turned in her direction. Embarrassment fired up her cheeks, but she managed to shake her head and give the professor a faint smile. He nodded and returned to his lecture. Clad in dark blue jeans, he rested now on the corner of his desk. His compact body partly blocked the image of the painting behind him. The tutorial continued, but Madison looked away through the classroom window. One of the spires jutting into the Oxford skyline caught her attention. Her breathing slowed, and the trembling of her hands stopped. Almost. She had been knocked off her feet before, but the ghosts had never made her sick enough to bring her breakfast to her lips. Never before had they been mere characters in a painting. So much for leaving behind her voodoo heritage and the long line of LeBon psychics. Madison gave herself a mental slap. She would not follow in her ancestors’ footsteps and end up a total whacko. She would not drown herself in the Mississippi or hang her pretty neck from the branch of a cypress. She would not let anyone shut her in a nuthouse. Just because she talked to those who were not there. Confusion seeped into her. She would stand, fight and die for her crazy family, for her Cajun blood. But no way am I going further into the loony bin. At least, not quite yet. When Doctor McCain signaled the end of the session, her fists were tightly clenched, her knuckles white. 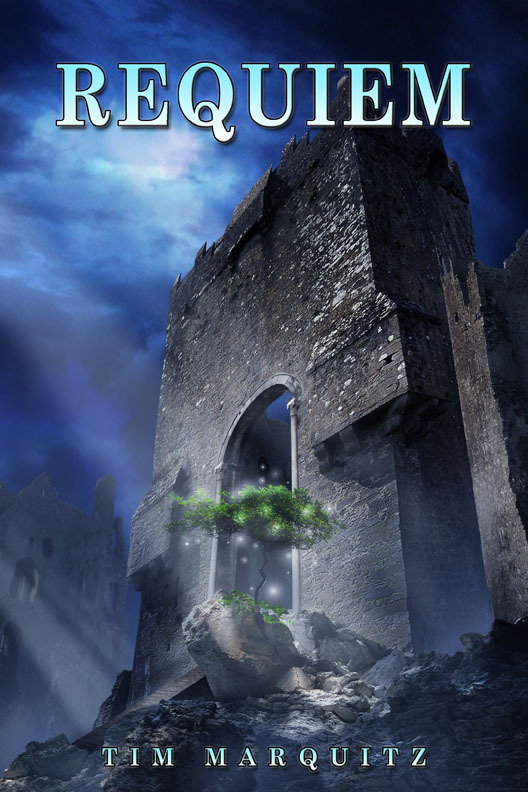 I’m almost finished with the second book in The Oxford Trilogy, Oxford Shadows. The release is scheduled for May 2013. The last installment is scheduled for October 2013. As soon as I’m done with Oxford Shadows and the draft is sent to my editor and critique partners, I’ll start with a contemporary romance, also in the New Adult genre. It should be out in July 2013. When I finished writing Oxford Whispers. It was a 90,000-word labor of love. I was so very proud of having a whole story put together. I’m very lucky because I’m writing full-time. My word count target is 1200 words a day. I write every day, and I try and include some time during the weekend as well. I spend some time blogging and on twitter (which I like very much)… but I need to be careful and not spend too much time on the social media. Humm… I have a writing cave, i.e. a little study where I have my desk and my laptop. I close the shutters, switch on the electric light and write. It’s not very healthy, I know, but that’s the only way for me to focus and get the words down. I have ALWAYS wanted to be a writer. As far back as I can remember. So each time I sit down and write, I’m making my childhood dream come true. My goal as a writer is to make readers dream bigger and cause their hearts to beat a little faster. Since my writing is all about sharing dreams and stories, I love connecting with fellow readers and authors. Readers, Marion will be giving away a $20 New Adult Reading pack --i.e. selected NA titles on Amazon to one commenter on her tour. So if you'd like to be entered to win, leave your e-mail address with a comment below or at any of Marion's other tour stops. The more you comment, the more chances you have to win. Feel free to leave a comment without an e-mail addy, too! Today's guest makes pastries during the day and writes romantic suspense at night. Kristi Loucks is here to tell us a bit about her debut novel, A Life Interrupted. You can learn more by visiting her other tour stops, too. Kristi Loucks is a Pastry Chef and Cake Designer with a degree from Le Cordon Bleu Chicago. Her writing and storytelling has always been a way to manage the day to day stresses of working in the world of restaurants and food service. Kristi started writing in High School and has continued to share her work with friends over the years. While she never planned to pursue writing professionally, a supportive friend armed with a copy of her debut novel, A Life Interrupted happened to share it with the right person. Since her debut was released in September of 2012, she has also released a novella, Delivery of Fate and is currently working on a new full length novel called The Rose Red Reaper, the first in a new series based in her home town of Chicago, IL. Ms. Loucks currently resides in a suburb of Chicago and runs a bakery in a North Shore Suburb. Welcome, Kristi. What inspired you to write this book? Writing is something I've always done, but in the last few years a group of friends started what we've referred to as a writing challenge. One person gives a set of prompts and a number of chapters. A Life Interrupted started as one of these challenges. It was supposed to be ten chapters, but when I hit ten chapters it wasn't even close to finished and I was on a roll. So I kept going with it. When I was about twenty chapters in, one of my friends suggested trying to publish it and I laughed it off. So, she decided to pass it off to a friend who works as an editor. I was at work when I got a call from an assistant to that editor asking if I would send the rest of the chapters. I sent the chapters and spoke to him a few days later and the rest started to fall into place rather quickly. I am working on what I believe will be a series of 2-3 books. The first is called The Rose Red Reaper and it's set in my hometown of Chicago. This book follows a Serial Crimes Unit that is focused on a cold case from a year earlier that is very personal to one of the team members. The killer taunts them with a signature kill style and a calling card that leaves little doubt that he's claimed each one. In addition, there appears to be no obvious connection from one victim to the next making him very unpredictable. Once the victims become connected, the team will have to move quickly to keep history from repeating. I’m hoping to have the first book ready for release by December of this year. I don't know that I ever really stopped to think about it. It's something I've always done to wind down after a busy day or week; I have always found writing to be a good way to disconnect from stress. I guess, I would say around February of this year though. 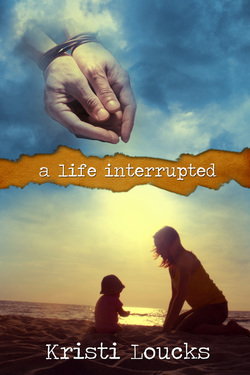 That is when I started to work on publishing A Life Interrupted which coincidentally went live on my birthday July 12. I don't write full time, but I do write every day. I work full time as a Cake Designer and Pastry Chef which is another creative field. I run a small bakery that handles both retail and commercial baking. Our main focuses are fresh breads and custom cakes that range from traditional to one of a kind. After a long day, you would think I would just go right to sleep, but I am a bit of an insomniac. So, most nights, I come home and write for a few hours to wind down. I do my best work in the middle of the night when the phones don't ring and there are no outside distractions. When I start a new story, I tend to write the last chapter in my head and then figure out how to get there. I'm not sure why or how that started, but it seems to work. It's kind of like buying a plane ticket I guess, obviously you know where you are going, and it helps you figure out how to pack and what you might do on that trip. I'm guessing that it's not the norm, but I've spent my entire life shying away from what most people would deem normal. I think that can be attributed to being the last of six kids, I had to find a way to create my own voice in order to be heard over my four brothers and my sister I suppose. And having a twin brother probably created that need to be different, too. As a twin everyone thinks of you as part of a matched set, so we did everything we could to prove that theory wrong. Yet, today I am really close to my brother. Gosh, it seemed like every week I wanted to be something different. I would say a veterinarian. I used to compete on the show jumping circuit and spent most of my time outside of school around horses, so that seemed like the best fit. That stuck with me through high school, but I had a hard time giving up the horses to go to school. Eventually, an illness and injuries made the decision for me. What I didn't realize early on was that I loved to cook. It had become something of an overlooked habit until a couple of friends went to culinary school, but eventually I made the decision to go to pastry school. Oddly, I hated cake decorating (I was TERRIBLE at it in school) and swore it was something I would never do outside of school. Two years later, my cakes were ending up in local magazines and I was no longer able to deny that I loved it. Of course! First and foremost, thank you for taking your time to read one of my books and I hope that you enjoy them as much as I've enjoyed writing them. And thank you all for following the blogs and seeking out new and interesting authors, too. There is no better time to be a writer, because we have so many amazing avenues to gain exposure with all of the blogs that review and recommend new works. Being an avid reader myself, I've found lots of authors that were new to me through blog posts, magazines, and friends. There really is no better advertisement than word of mouth and these days there is a much broader reach with all of the digital media and social media outlets. Thank you, Lisa, for taking the time to put together this interview and sharing it with your readers. I really appreciate it. It was actually fun to sit down and think about the choices I made that brought me to where I am now. It's been my pleasure, Kristi. I think you're the first pastry chef I've had - and your writing isn't bakery-related! Happy touring! Readers, you can learn even more about Kristi by visiting her other tour stops. A hearty welcome to today's guest, mystery author Kaye George. She's here to talk a bit about her multiple series and in particular, the newest Imogene Duckworthy mystery, an Agatha Nominee, Broke. Kaye George is a short story writer and novelist who has been nominated for Agatha awards twice. She is the author of three mystery series, the Imogene Duckworthy humorous Texas series, the Cressa Carraway musical mystery series, and the FAT CAT cozy series with Berkley Prime Crime. The last two will debut in 2013. Her short stories can be found in her collection, A PATCHWORK OF STORIES, as well as in FISH TALES: The Guppy Anthology, ALL THINGS DARK AND DASTARDLY, GRIMM TALES and in various online and print magazines. She reviews for "Suspense Magazine", writes for several newsletters and blogs, and gives workshops on short story writing and promotion. Kaye is agented by Kim Lionetti at BookEnds Literary and lives in Texas, near Waco. Welcome, Kaye. Please tell us about your current release, Broke. Imogene Duckworthy is twenty-two and has a job (PI assistant) and a new car (used). She loves her mother, but it's time she was on her own. 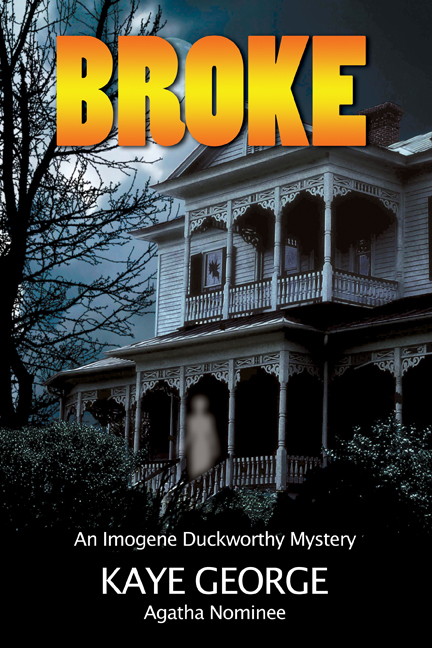 The problem is her daughter Nancy Drew Duckworthy’s pet potbelly. Not a lot of rentals in Wymee Falls will permit a pig, even one as cute and charming as Marshmallow. Jersey Shorr of Shorr Realty manages to find something but there are rumors that the house is haunted. Immy tells herself she doesn’t believe in ghosts. She signs the contract and plans to move in before Halloween. What she doesn’t plan on is the very real, very dead body in the bathtub. And the fact that the most logical murder suspect is her Uncle Dewey, fresh out of prison. Immy can’t allow her long-lost relative to be railroaded for a crime he (possibly) didn’t commit, can she? It's a continuation of Immy's adventures and was high time to get her out of Saltlick. This gave me a chance to introduce some new characters, including a long-lost uncle who was alluded to in an earlier book. Since I set it in October, both Immy's four-year-old daughter Drew (Nancy Drew Duckworthy) and Drew's pet potbelly pit, Marshmallow, had to have costumes. Thinking of costumes got me to thinking about ghosts. Also, if Immy were trying to find a new place to live for her and Drew and Marshmallow, I had to think about what kind of land lord would want a pig in the rental house. October, ghosts--a haunted house, of course! I'm presently working on two projects, one for Barking Rain Press (BRP) and one for Berkley Prime Crime (BPC). For BRP, I'm doing final edits on Eine Kleine Murder . A bit about that book: When aspiring conductor Cressa Carraway arrives at her grandmother's resort home, she finds Gram dead. When Gram's best friend drowns in the same place, Cressa knows something sinister is at work in this idyllic setting. I'm excited to be getting this book published since the sleuth is a musician, like me, and I was able to include material about the classical music world. If this series continues, Cressa will become a conductor and I can do lots more with that subject. The project for BPC is the first book of the FAT CAT series, set in Minneapolis, as yet untitled, and still in first draft. This series will feature a pudgy, adorable, clever cat named Quincy who is always trying to find more to eat, since his owner has put him on a diet. When he escapes, he finds all sorts of things, including dead bodies. His owner, Chastity (Chase) Oliver is the co-owner of a dessert bar shop and the books will feature dessert bar and diet cat treat recipes. In public? In 2005 when I got my first short story published in FMAM. However, I've made up stories since before I could write. I've had publication ambitions since high school, but the only thing that saw print then was a letter to the editor in the local paper. I was able to retire from programming about 11 years ago and have been writing full time since then. I usually clear emails, write blogs, and do other administrivia at the beginning of the day, since I'm not a morning person. After lunch I sometimes run errands, then write after that. But on good days, I'm able to write after lunch. However, I do some of my best work after the 10:00 news. Hmm, I don't know that my writing is quirky, or would be that interesting to watch. I do prefer absolute quiet, so I like a room with a door I can shut. I can't work at all if a neighbor dog is barking, so I got myself a Super Bark Free from the Sky Mall catalog. It's a life saver! I can aim that thing at a neighbor dog and it emits a high-frequency noise, audible only to the dog. I'll bet the neighbors wonder why their dogs become so well-behaved everywhere we live. I remember wanted to be a garbage collector. We used to follow the truck up the alley, me and the neighbor kids. We didn't own a TV until I was 7, so we played outside a lot. It seemed to be romantic and exciting, jumping on and off the truck, hanging onto the rail while it drove all over the town. I now know that they don't make bad money and it's a steady job and probably beats some of the jobs I have had. I'd like to emphasize that, while I'm currently working on 3 series all of a sudden, and may look like an overnight success from the outside, it has taken me years and years of writing, improving my craft, studying other writers and taking courses, networking and making connections, and hard work to get my babies into the light of day. Please visit my webpage and connect with me on Facebook, Twitter, Pinterest, or at one of the blogs I write for. Thanks so much for the interview, Lisa! Great questions. You're quite welcome. It's been a pleasure hosting you. Happy writing! The Writer's Chatroom presents dark fiction author Tim Marquitz. As we wrap up October, and since it's just before Halloween, I think it's great that today's guest is dark fiction author Alan Steven Kessler to talk about his spiritual horror story, A Satan Carol. Alan and his publisher, Wild Child Publishing, will be awarding a $10 Wild Child Publishing gift card to a randomly drawn commenter during the tour (international), and a 12-pack of Snackwells Devils Food cookies to another commenter (US/Canada only). So if you'd like to be entered to win, make sure to leave an e-mail with your comment below. And you can improve your chances of winning by following his tour and commenting at other stops. I was born in a small town in Ohio. I currently live in New England with my wife, four children, and dog buckeye. What does the devil really want? Nostalgic for the Inquisition and plague, Satan feels neglected by the modern world that no longer blames him for disease and death. He plans to create a new genesis, a place where people will love him. For that, his son needs just the right soul. And there is one—unique, powerful, able to heal. To get it, Satan has a plan that begins in Ireland in the famine year, 1848, and 180 years later traps a young girl and her family in demonic forces pushing them to kill. 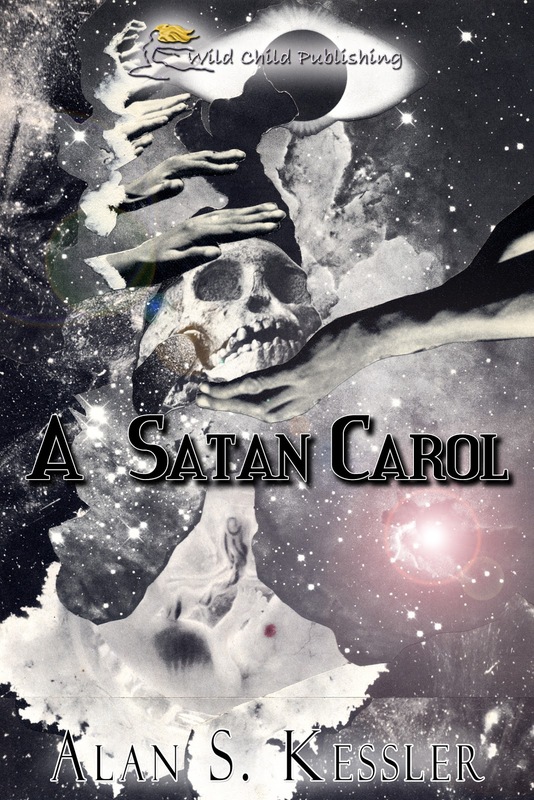 A Satan Carol is a horror story about family values--even if they originate in hell. On back of the EnViro truck continuing across the grassless, treeless land, Orem couldn’t tell if the gray, steaming waves he saw lapping sluggishly against a beach were those of a bay or ocean. He could distinguish the two structures whose dark shapes he had seen from a distance, the one closest to him an old farmhouse painted black, beyond it, a ramshackle pier standing a half mile from the shoreline. When the truck passed the pier, Orem saw what looked like a junkyard where the road ended. As the truck slowed before entering the junkyard’s fenced in area, he let go of the handle and jumped, rolling in dirt so dry and light he inhaled it as if it were another form of air. Choking, he took small breaths, sat there slowly adapting to the particle laced, heated atmosphere. Hello hello. Can you hear me? Orem blinked and looked over to where a boy sat slumped and drooling in a stroller parked a few yards from the junkyard fence. Behind the child, a young girl, very thin, stood gazing out at the water. Children? In Hell? To Orem that didn’t make sense. And he was sure the girl had just spoken to him. Is it possible, by some miracle, I’m still alive? A novel about a boy who grows up in a house of demons. It is a horror story without drool and gore. At 11. I wrote a sci-fi story about the world exploding. I write during the day when I’m at work and can find the time. I’m self-employed—the owner of a karate school. I self-edit as I write. I just wanted to grow up. My family was a wee bit challenging. Thank you. I hope I can give you a story that is both entertaining and thoughtful. You're welcome, Alan. Happy to have you. Readers, Alan and his publisher, Wild Child Publishing, will be awarding a $10 Wild Child Publishing gift card to a randomly drawn commenter during the tour (international), and a 12-pack of Snackwells Devils Food cookies to another commenter (US/Canada only). So if you'd like to be entered to win, make sure to leave an e-mail with your comment below. And you can improve your chances of winning by following his tour and commenting at other stops. 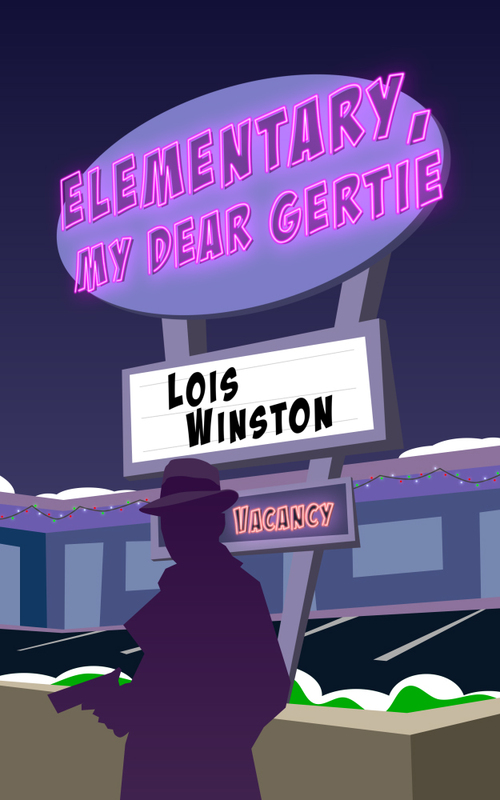 Today's guest is a return visitor, but this time she's using her real name, Lois Winston and her new book is called, Elementary, My Dear Gertie. You can read the Emma Carlyle interview about Someone to Watch Over Me. Award-winning author Lois Winston writes the critically acclaimed Anastasia Pollack Crafting Mysteries series featuring magazine crafts editor and reluctant amateur sleuth Anastasia Pollack. Assault With a Deadly Glue Gun, a January 2011 release, is the first book in the series and received starred reviews from both Publishers Weekly and Booklist. Kirkus Reviews dubbed it, “North Jersey’s more mature answer to Stephanie Plum” Death By Killer Mop Doll, the second book in the series, was released this past January. Revenge of the Crafty Corpse will be a January 2013 release. Lois is also published in women’s fiction, romantic suspense, and non-fiction under her own name and as Emma Carlyle. In addition, she’s an award-winning crafts and needlework designer and an agent with the Ashley Grayson Literary Agency. You can visit Lois or Emma, or Anastasia at the Killer Crafts & Crafty Killers character blog for more about each of their stories. Lois, welcome back to Reviews and Interviews. Please tell us about your newest release, Elementary, My Dear Gertie. In this novella, sequel to the award-winning Talk Gertie To Me, two years have passed since the happily-ever-after that isn’t doing so well. Nori Stedworth has moved in with the love of her life, Mackenzie Randolph, much to her parents’ displeasure. They’re coping as best as parents from Ten Commandments, Iowa can. They want Mac to make an honest woman of their daughter, and that means nothing short of marriage. Mac is all for exchanging I do’s. He’s even bought the ring, but before he can pop the question, an explosion hurls him and Nori right into the middle of a murder investigation, and yet another scandal envelopes the not-so-pious residents of Ten Commandments. For years I’ve had people asking me if there would ever be a sequel to Talk Gertie To Me. Because I had left my publisher and turned to writing mysteries, I never considered a sequel. However, Gertie doesn’t take no for an answer and kept nagging me the way she always nagged Nori. She also has this annoying habit of always being right. I eventually capitulated and sat down to write a sequel. However, writing mystery had taken over my life, and as I started to work on the book, all sorts of mystery plots bombarding me. So I decided to write a sequel that combined the humorous women’s fiction of Talk Gertie To Me with the humorous amateur sleuth style of mysteries I’m now writing. The result was Elementary, My Dear Gertie, a novella sequel. I'm currently working on Death By Decoupage, the fourth book in my Anastasia Pollack Crafting Mysteries series. Because I'm writing an ongoing series, my biggest challenge is finding new adventures for Anastasia that both progress her story and keep the readers wanting more of her. There's a story arc that runs throughout the series, but I can't have any major resolutions of her main problems or the series will be over. So I keep dangling the carrot in front of her, giving her little nibbles, but always yanking it out of her reach in the end. Because I'm writing an amateur sleuth series that features a protagonist who works at a job I'm familiar with, I don't need to do much research. Occasionally I'll need to verify something and place a call to an expert. For instance, in Revenge of the Crafty Corpse, which will be out in January, I needed to learn the sequence of events after someone dies in a nursing home. I placed a call to the owner of a local funeral home. Most people are thrilled to be able to help an author with research. I have a dedicated office that I use for both my writing and crafts. There's a wrap-around desk and four large bookcases. My husband erected shelves in the double closet, and that's filled with all my craft supplies. I'm a very eclectic reader. When I want to laugh, I pick up the latest Stephanie Plum book by Janet Evanovich. A few years ago I fell in love with Ariana Franklin's historical mysteries. Both her Mistress of the Art of Death series and the stand-alone City of Shadows were phenomenal. For romance, no one beats Susan Elizabeth Phillips. For women's fiction, I turn to Kristin Hannah. I hope readers will check out my website, Emma's website, and Anastasia's blog. And drop me a line. I love to hear from readers. Also, I've offered to make a $500 donation to breast cancer research for every 1,000 Emma Carlyle books that are sold through the end of October, Breast Cancer Awareness Month. There's still a few days left in October for people to help me make a difference. For less than the price of a latte, you can help save the girls! You're very welcome. Keep the words flowing! 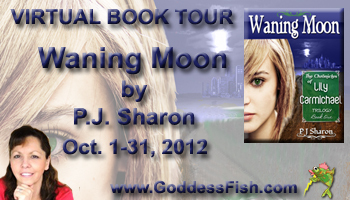 Today is a virtual blog tour stop for author PJ Sharon. 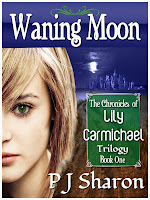 She's touring her book, Waning Moon, Book One in The Chronicles of Lily Carmichael Trilogy. Along with the tour, PJ will be awarding an e-book copy of "Thin Ice" to one commenter at each stop and a $25 Amazon or BN GC to a randomly drawn commenter. To be entered, leave an e-mail address with your comment. (Feel free to comment without an email too!) And if you'd like more chances to win, you can follow the tour and comment at other stops. I knew I would be a writer someday when I was a little girl sitting on my grandpa’s knee and telling him stories that he would help me put on paper. By the time I entered kindergarten I could already read and write, and I couldn’t wait to look up new words every morning in the ginormous Webster’s Dictionary that sat in the book case at the bottom of our stairs. I would get on the bus and ask my friends, “Do you know what pulchritudinous means?” Between that and challenging the boys to push-up contests at the bus stop, I mostly sat alone on those bus rides to school. But that just meant I had more time to make up stories. I went on to many other endeavors in life, including the world of figure skating, and later, martial arts. Though I was a mom at seventeen, I did manage to finish school and somehow made it through college, earning a degree as a Physical Therapy Assistant. After nineteen years, two sons, a divorce, and some fairly lean years, I found that it’s true what they say about life beginning at forty. It was about that time when I reunited with the love of my life and worked my way to owning my own business as a Massage Therapist, Personal Trainer, and Yoga Instructor—all of my favorite things. To make my bliss complete, I moved out to the Berkshires and found my muse waiting for me there amongst the lilacs and humming birds. I now write Extraordinary Stories of an Average Teenage Life in order to share hope with others, especially teens, that no matter how tough life gets, there is always a bright spot waiting just around the corner. The Chronicles of Lily Carmichael is a trilogy that takes place in the year 2057. It’s about a sixteen-year-old girl and her brother who are the first generation of genetically engineered EVO children bred to survive the plagues that wipe out three quarters of the Earth’s population. Her genetic modification not only makes her resistant to the plague, but gives her the ability to heal quickly and gives her an intuitive ability to heal others—everyone except for Sam, the uncle to whom she owes her life. Lily’s thirteen-year-old brother Zephron has a darker gift—the ability to take life with his touch, and Lily is determined to teach him to control it. Their mother died during Zeph’s birth and their father was killed by a government agency called the Industry, an organization trying to capture EVO kids to use them for their own means. Lily and Zeph live with their uncle in the North East Sector. Sam is a brilliant engineer determined to keep them hidden from the Industry. But when a young drifter named Will is caught in a trap on their property and Lily decides to heal him, their secret is bound to get out. 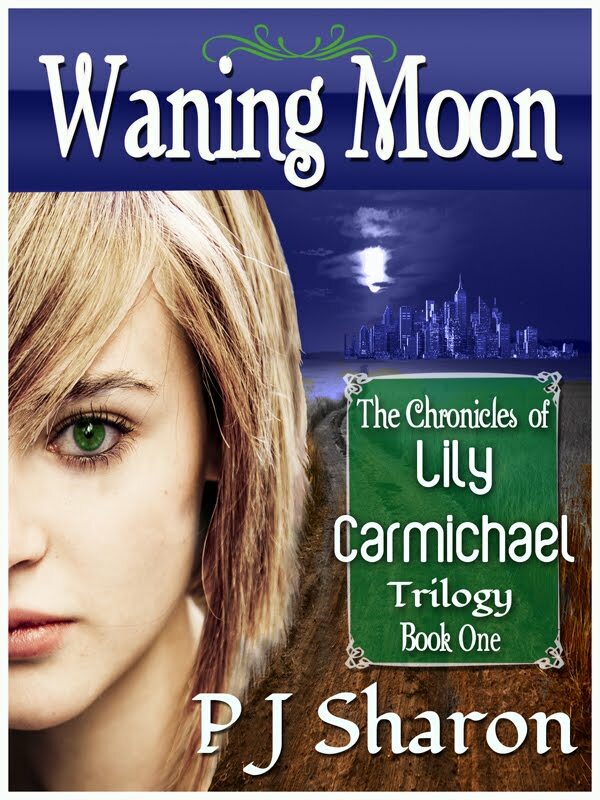 Waning Moon, Book One in the trilogy, chronicles Lily’s journey with Will into the trading post of Albany, where she must find a cure for Sam’s cancer before it’s too late. In the year 2057, in a post-apocalyptic world where a global shift threatens the remainder of the population with extinction, sixteen-year-old genetically enhanced Lily Charmichael has more immediate problems. Her uncle is dying of cancer and her healing abilities are ineffective against the blood ties that bind them. In order to find a cure, Lily must leave the protection of her quiet town and journey into the trading city of Albany, all while avoiding the Industry, an agency that would like nothing better than to study and exploit her abilities. Seventeen-year-old Will Callahan has been searching for his father since severe storms blasted through the Midwest, killing his mother and sister. When he learns that his father may be in the city, he catches a ride with Lily, a girl who has come to his rescue more than once. As the two embark on a dangerous journey, the attraction between them grows. But the secrets Will’s keeping could put her in far more danger than traveling to the city with him, and if he was any kind of man, he would have told her to run the minute she found him. There is so much concern today about where our world is heading. People live in fear of what will happen if our economy collapses or we have a climactic event that changes the landscape of our planet. Kids and teens especially, are both terrified and fascinated by dystopian stories of post-apocalyptic survival, making books like The Hunger Games or Hollow Land part of the new pop culture. I live out in the Berkshire Hills in a small remote town with neighbors who love living in the woods as much as my husband and I do. We often get together and talk about current events and contemplate our survival strategies. We aren’t quite as bad as the Doomsday Preppers, but we do try to be prepared for whatever the future holds. Humans are the most adaptable creatures on the planet, and in keeping with my “hopefully ever after” philosophy, I wanted to show how we might survive if life as we know it took a turn for the worse. “Of course I am!” I sniffled and gained control, not wanting my weakness to show in front of my little brother. I’d spent my life being strong for him—protecting him. Now he reached out a hand. To anyone else, this could be deadly, but his touch had no effect on me, a fortunate side effect of our shared DNA, and I had spent countless hours teaching him to control the power that he could summon at will. I squeezed his fingers and gazed into those black eyes. A sudden rush of peace washed over me. Zeph’s peace—the peace he felt whenever he took a life with his touch. Soothing warmth covered me like melted wax. I felt as if he were drawing the dead man’s energy off of me, trying to relieve me of my burden somehow. I pulled my hand away. Zeph closed his fingers into a fist. “It’ll be okay. You had no choice. It was him or us.” His voice sounded calm, sure, eerily complacent. I shuddered. I’ve just completed the short story prequel to the trilogy. It’s called SOUL REDEMPTION, and will be part of the WG2E October Anthology. I wrote it from Zeph’s point of view and what it would be like for a thirteen-year-old boy to wrestle with the ability to kill with a touch. Add hormones and you’ve got big problems. Definitely a creepy short story fitting for October. Next up is Book Two of the trilogy, called Western Desert, where we get to share Lily and Will’s journey across a post-apocalyptic US to where the Industry is holding EVO children captive. Hee hee, that sounds like the perfect time, and perfect way to celebrate! I consider both of my jobs pretty much full time. I sleep 6-7 hours a night, and other than that I’m either working 20-30 hours a week at my office as a massage therapist, teaching a yoga class, personal training with a client, or working on some element of the writing business. I do take time out to eat occasionally, exercise a few times a week, and pay some attention to my wonderfully supportive and adorable husband, but thankfully, he is very self-sufficient and seems happy to do the cooking while I type away. My kids are grown, so my time is my own these days, with very few distractions. It’s a good place to be. As much of a multi-tasker as I can be, I’m also a finisher. I love checking things off my to-do list and will go to great lengths to finish a project just to draw a line through that one thing. That includes staying up past midnight most nights so I don’t have to look at those items I didn’t get done. I’ve learned to be satisfied with completing only three of my tasks in a day. If I can do more, great, but if I’ve done the three at the top of the list, I feel like I’ve accomplished something. A teacher…then a cop or a detective…then a doctor. Eventually I settled on being a Physical Therapist Assistant while I was raising my sons. It was a great job for me, but I’m very happy owning my own holistic practice these days. I have always told my children that in order to be truly happy, you need to find something you love to do, get really good at it, find a way to make money doing it, and then make it serve the greater good. I think that’s pretty good advice for all of us. My pleasure, PJ. Happy touring! I'm happy to welcome P.M. Terrell back to Reviews and Interviews. Her last interview focused on Vicki's Key. Today, is just one stop along her virtual book tour for Secrets of a Dangerous Woman. A lucky commenter during the tour will be awarded a $25 Amazon Gift Card. If you'd like to be entered to win, leave an e-mail with your comment. (Feel free to comment without an e-mail addy, too!) And if you'd like more chances to win, follow her tour and comment at other blog stops. P.M. Terrell is the award-winning, internationally acclaimed author of more than 14 books, including the Black Swamp Mysteries series. Formerly the founder of two computer companies in the Washington, DC area, her specialty is in computer intelligence and white collar computer crime. Her clients included the U.S. Secret Service, Department of Defense and the CIA as well as local law enforcement. A full-time writer since 2002, she uses her expertise in plots that often involve computer crimes and cyberintelligence. She makes her home in Lumberton, North Carolina, which is the location of the Black Swamp Mysteries series. Welcome back to Reviews and Interviews, PM. In Secrets of a Dangerous Woman, Dylan Maguire is back and in his first role as a CIA operative: to interrogate recently captured Brenda Carnegie. But when she escapes again, it’s obvious she’s had help from within the CIA’s own ranks. With Vicki Boyd’s psychic assistance, he captures Brenda again—but this time his mission has changed. Now he must find out why some in the highest government offices want her killed—and others will risk everything to help her. And when he discovers her true identity, his mission has just become very personal. Brenda Carnegie first appeared in Exit 22, which was released about four years ago. Since then, my fans frequently asked when I was going to bring her back and what happened to her after she disappeared at the end of that book. Brenda is a computer hacker who prefers to operate on the wrong side of the law; she’s savvy, street-wise and as capable of navigating alligator-infested swamps as she is the cyberworld. Dylan Maguire, the Irishman I introduced in Vicki’s Key earlier this year, was such a hit with readers that I also knew I had to bring him back. He is resourceful, an opportunist, good humored but with a secretive past. And I knew getting the two of them together would be explosive. 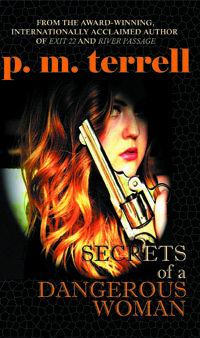 They each have met their match in Secrets of a Dangerous Woman. I am currently working on the next book in the series, Dylan’s Song. Toward the end of Secrets of a Dangerous Woman, Vicki discovers that a CIA operative disappeared in Dublin while following the trail of a known terrorist. Dylan’s Song picks up there: Vicki must use her psychic abilities to pinpoint where the operative is being held and Dylan’s mission is to extract him and bring him back safely to the States. And when Dylan learns that his grandmother is on her deathbed, he returns to the place where he grew up—with Vicki in tow. While there, Vicki learns the real reason he left Ireland for the United States—while harboring a bigger secret of her own. I like to surprise my readers. The reason I resisted writing a series for so long is I didn’t want to become a formula writer where readers could easily guess the ending. The challenge for me is to keep each plot fresh, original and surprising. I love the characters I’ve assembled for this series so one challenge I used to have with stand-alone books no longer exists: I no longer need to introduce each character and complete their backstory in one book. I can make them more multi-dimensional, knowing the layers will be peeled away throughout the entire series. It depends on the book. I once spent two years researching the true historical adventure Songbirds are Free, which was published in 2008. But with this series, I’ve been able to research the general crime before I begin writing each book plus I continue to research the details as I am writing. I will often need to phone or email my technical advisors—police detectives, FBI Agents and others—while writing. And once the book is just about ready to go to the editors, I will send the manuscripts to those technical advisors so they can make sure I have procedures correct. I have a lot of law enforcement who follow my books and I don’t want to make mistakes that would cause me to lose credibility. Once lost, it’s very difficult to get it back. I have an office in a building that is separated from my main house and I enjoy writing there. But my days can become very long (often 12 hours or more) so I will sometimes take my laptop to my great room, where I am surrounded by aquariums containing angelfish (which also happens to be the front for Vicki and Dylan, who are both CIA operatives but pretend to be angelfish breeders.) I honestly feel my muse more when writing in the comfort of the great room; it’s more relaxed than sitting at my desk, where other duties often pop up. I love Erin Quinn’s Haunting series; I like the originality of the time travel and whether you can change your destiny—after it happened. I also love Anne Rice’s book Ramses and wish she had written more about Egypt and mummies. I enjoy David Pereda’s series about a female assassin and Carla Neggers’ books that take place in Ireland. I will often read outside my genre if the writing is good, whether it’s a fantasy, non-fiction or even erotica. I love taking my readers on a roller coaster ride. I have so many pressing duties that it’s difficult for me to sit down and read—so the author has to grab my attention at the very beginning and hold it. I try to take that into consideration when I am writing for others; I know their time is valuable and they have many other things to do and other authors to read. So I try to pull them in as quickly as possible, take them outside of their own reality and into other worlds, and long after they put the book down, I hope the characters remain with them. I also started an annual writers conference and book fair that takes place on the last Saturday of each February in Lumberton, NC. Called Book ‘Em North Carolina, we raise money to increase literacy in our communities. This coming year, we’ll bring together more than 75 authors, publishers, literary agents and book promoters—and one awesome Hollywood producer who will talk about making books into movies. Attendance is free and open to the public, so I hope your readers will be able to join us for panel discussions, one-on-one chats with their favorite authors and much more. More information is at www.bookemnc.net. Readers, remember, a lucky commenter will be awarded a $25 Amazon Gift Card. If you'd like to be entered to win, leave an e-mail with your comment. (Feel free to comment without an e-mail addy, too!) And if you'd like more chances to win, follow her tour and comment at other blog stops.